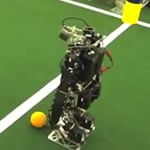 The name NUbots stand for Newcastle University robots and is the name of the robot soccer competition team of the Newcastle Robotics Lab., Australia, since 2002. ASIMO is a humanoid robot created by Honda. Standing at 130 centimeters (4 feet 3 inches) and weighing 54 kilograms (119 pounds), the robot resembles a small astronaut wearing a backpack and can walk or run on two feet at speeds up to 6 km/h (3.7 mph), matching Hitachi's EMIEW. 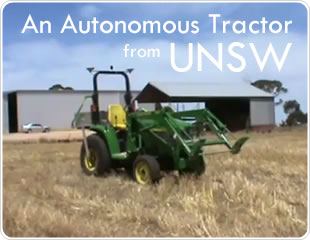 Research at the University of New South Wales, Australia is aiming to provide control mechanisms that can manipulate the agricultural tractor with precision. 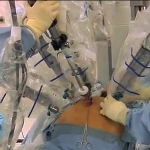 This video demonstrates use of the da Vinci Robot to conduct minimal-invasive surgery. The Nao Devils Dortmund are a RoboCup team by the Robotics Research Institute of TU Dortmund University participating in the Standard Platform League as the successor of team BreDoBrothers, which was a cooperation of the University of Bremen and the TU Dortmund University. Qualification video for RoboCup 2011 in Istanbul. 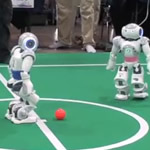 Dutch Robotics presents TUlip, a humanoid soccer robot to compete in the Adult-size League. 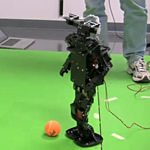 Demonstrates RoboPatriot kid-size humanoid model tracking ball, kicking it into a goal, and standing up, several times. Video taken at the GMU Autonomous Robotics Laboratory, George Mason University, United States of America. Researchers at the Case Western Reserve University School of Engineering are working on developing a joystick and voice command system for wheelchair users with cognitive impairment. 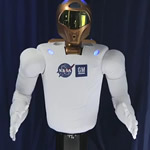 In the current iteration of Robonaut, Robonaut 2 or R2, NASA and General Motors are working together with assistance from Oceaneering Space Systems engineers to accelerate development of the next generation of robots and related technologies for use in the automotive and aerospace industries. The Swumanoid project has be developed by the Nakashima Group at Tokyo Institute of Technology. It is hoped that the Swumanoid will help understand how humans can swim at a faster pace and to make this technology a good tool for helping athletes enhance their speed at swimming. The autonomous Robot soccer team from Virginia Tech (RoMeLa) and the University of Pennsylvania (GRASP) for the RoboCup 2011 Humanoid League. 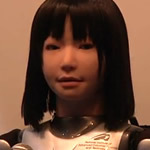 The HRP-4C is a female humanoid robot, created by the National Institute of Advanced Industrial Science and Technology, a Japanese research facility, and publicly demonstrated on March 16, 2009.